Confederate States of America An Act Relative to Prisoners of War. 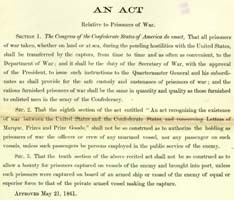 An Act Relative to Prisoners of War. Confederate States of America. Army -- Prisons. Prisoners -- Legal status, laws, etc. -- Confederate States of America. Prisons -- Law and legislation -- Confederate States of America.